Relying on service warranty alone is not enough when you buy gadgets nowadays. There are other factors involve that may not be covered by the brand's warranty clause. Luckily, you can now opt to have your newly Apple devices purchased at Power Mac Center insured for damages and other incidentals not covered by the usual warranty clause such as: water damage, cracked screen, theft, etc. 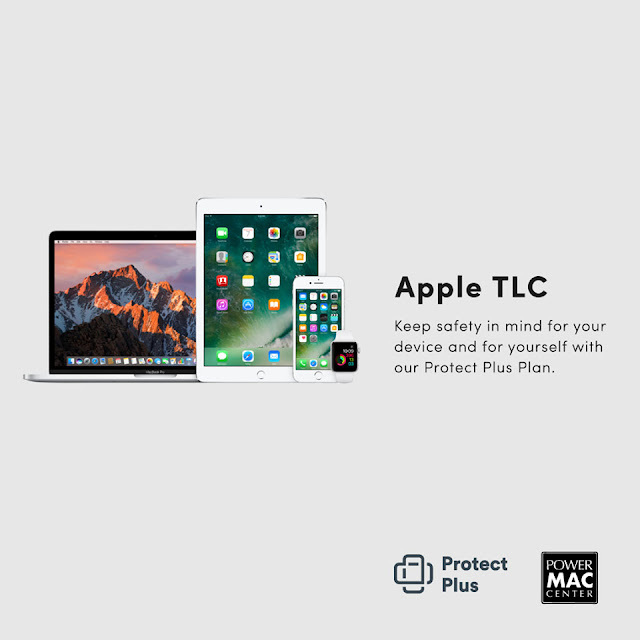 To avail of Protect Plus, customers of newly purchased Apple devices at Power Mac Center may avail of this gadget protection insurance offer. A premium of 12 percent of the device' current retail price entitles you to one year insurance protection. This adds benefits in cases of accidents causing damage to the device or its owner. This is separate from the standard Apple warranty though. Claiming is also easy, just call the Protect Plus hotline or send an email within 7 days from the date of the incident. Protect Plus will shoulder Diagnostic Fee and repair costs for accidental damage claims. There's a participation fee for approved claims which is 20 percent of the device's original purchase price. "Power Mac Center's latest offering, Protect Plus, is actually a security and peace of mind in a nutshell. It's a reestablishment to provide unparalleled service to the Filipino Apple market. Now you can be worry-free no matter your lifestyle because of the extra precaution Protect Plus provides," said Joey Alvarez, Marketing Director, Power Mac Center.